'This morning, we’re part of a large group of artists, designers and activists who have written to the Design Museum asking that our work be removed from the current Hope to Nope exhibition of political art. The letter and signatories can be found here and are also copied below. 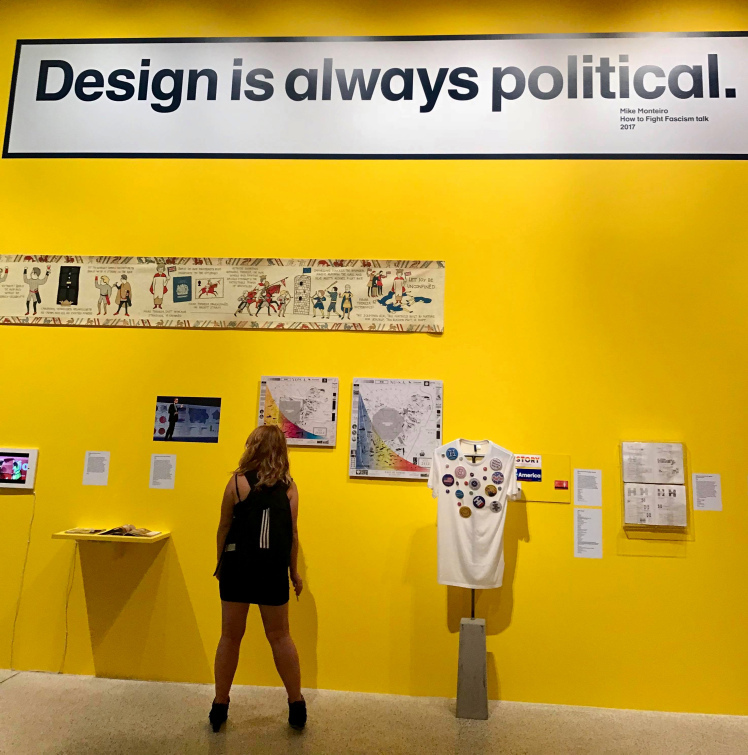 The Hope to Nope exhibition, which runs until August 12th 2018, explores “how graphic design and technology have played a pivotal role in dictating and reacting to the major political moments of our times.” It includes one of our BP logo ruffs, which we lent to the museum. Why are we demanding our stuff back? Because last Tuesday, 17th July, the museum hosted an arms industry event as part of the Farnborough International arms fair. We only learned about the event as it coincided with a talk at the museum about the role of design in the rise of Jeremy Corbyn. Ash Sarkar, a participant in that talk and signatory to the letter, learned the other event happening in the building was an arms reception and tweeted about it. The event was organised by Leonardo, which is estimated to be the world’s ninth largest arms company. Leonardo has armed and supported human rights abusing regimes and dictatorships around the world; including Saudi Arabia, Turkey and the Philippines. Danny Chivers from BP or not BP? said: “Our object in Hope to Nope – a Shakespearean ruff in the shape of the BP logo – specifically challenges the unethical funding of arts institutions. So it’s jaw-dropping that the museum hosted an event for one of the most unethical industries on the planet while displaying our object on its wall. Arms dealers and fossil fuel companies both promote conflict and destruction around the world, and no respectable museum should be working with either of these industries. The Leonardo booking at the Design Museum appears to be an attempt by the arms industry to continue holding events in London museums, despite the huge controversy of previous years. The Design Museum must have known that this would be a controversial booking, hence the secrecy around the nature of the event itself, with participants in the Hope to Nope talk on the same evening being told to use separate entrances. This week’s action by artists comes just four months after performers threatened to pull out of the Great Exhibition of the North over its sponsorship by BAE Systems. The sponsorship in that case did not go ahead. In light of all this, Culture Unstained have written a great blog on five things the Design Museum should have done before saying yes to an arms dealer party. Let’s hope the museum learns its lesson and doesn’t let this happen again. We are writing as artists, designers and activists whose work features in your current ‘Hope to Nope’ exhibition, and in the museum’s permanent collection.